The Meridian Revolving Restaurant, 54th floor, Pattaya Park Beach Hotel, 345 Moo 12, Tabpraya Rd, Nongprue, Banglamung, Chonburi, Thailand 20260. International Buffet for Lunch 11am-3pm. Seafood Dinner 5pm-10pm. +66 3825 1201 8. 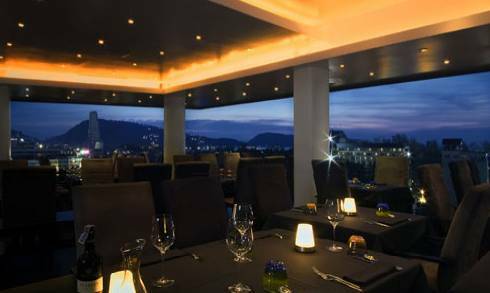 The Pinnacle Revolving Restaurant, 53rd floor, Pattaya Park Beach Hotel, 345 Moo 12, Tabpraya Rd, Nongprue, Banglamung, Chonburi, Thailand 20260. +66 3825 1201 8. The Panorama Revolving Restaurant, 52nd floor, Pattaya Park Beach Hotel, 345 Moo 12, Tabpraya Rd, Nongprue, Banglamung, Chonburi, Thailand 20260. +66 3825 1201 8. 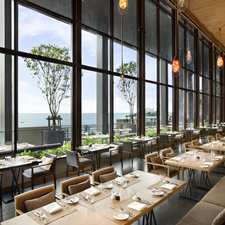 Horizon Restaurant and Bar, 34th floor, Hilton Hotel Pattaya, 333/101 Moo 9, Nong Prue, Banglamung, Chonburi, Pattaya 20260. + 66 38 25 3000. Daily 5pm-1am. Shore, 16th floor, Hilton Pattaya Hotel, 333/101 Moo 9, Nong Prue, Banglamung, Chonburi, Pattaya 20260. +66 38 25 3000. Laid-back outdoor bar and restaurant. Daily 8am-8pm. Drift, Hilton Pattaya Hotel, 333/101 Moo 9, Nong Prue, Banglamung, Chonburi, Pattaya 20260. +66 38 25 3000. 9am-1am. Take in sweeping views of Pattaya Bay. Edge, 14th floor, Hilton Pattaya Hotel, 333/101 Moo 9, Nong Prue, Banglamung, Chonburi, Pattaya 20260. +66 38 25 3000. The Monte Carlo, 34th floor, Adriatic Palace Hotel, Pattaya, Thailand. +66 3836 4333. Enjoy the sea views and sunsets while dining at this rooftop restaurant. 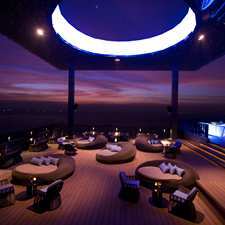 Sunset Lounge, Dusit D2 Baraquda Pattaya Hotel, 485/1 Moo 10, Pattaya 2nd road, Tambol Nongprue, Amphur Banglamung, Central Pattaya, Pattaya, Thailand. +66 3876 9999 20260. Sun to Thurs 4pm-1am. Fri & Sat 5pm-2am. 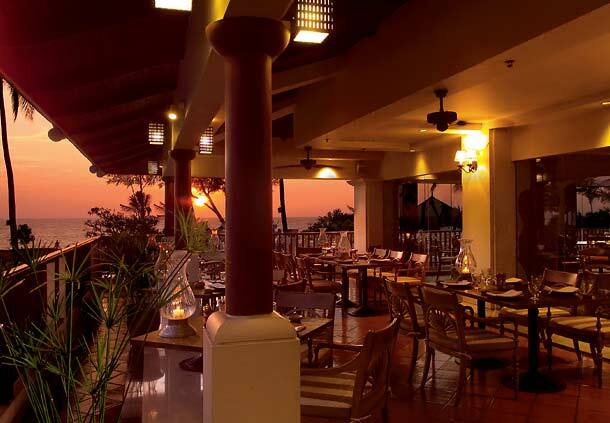 Andaman Grill, JW Marriott Phuket Resort & Spa, 231 Moo 3, Mai Khao, Phuket 83110. +66 76 33 8000. Next to the Main Pool on the beachfront with sweeping views of the Andaman Sea. Dinner 6pm-10pm. Cucina Kitchen, JW Marriott Phuket Resort & Spa, 231 Moo 3, Mai Khao, Phuket 83110. +66 76 33 8000. Rooftop Pool Bar, 7th floor, Destination Patong Hotel, 48 Ruam Jai Road, Patong Beach, Patong, Phuket, Thailand 83150. +66 76 337 000 Enjoy a refreshing soft drink, smoothie, cocktail or a bottle of wine at the Rooftop Pool Bar which also serves light meals, sandwiches, salads, snacks, pizza and desserts. 11am-7pm. Happy Hour 7pm-9pm. Sunflower Chinese Restaurant, Centara Duangtawan Hotel, 132 Loy Kroh Road, Chang-Klan, Muang, Chiang Mai 50100, Thailand. +66 5390 5000. Perched atop the hotel, the restaurant has a spectacular view of the city. 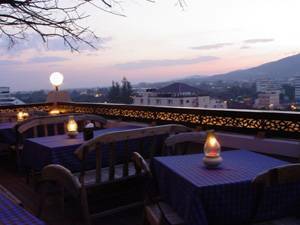 Lavender Sky Rooftop, Lavender Lanna Hotel, 6 Bunruengrit Road, Chiang Mai, Thailand 50200. Beautiful rooftop restaurant. Gay. Loft Pub & Restaurant, Floor 10, Doi View Tower soi 9, Nimmanhaemin Road, Chiang Mai. Features fine dining with a panoramic inner city scene and the spectacular view of Doi Suthep at one glance. THC Rooftop Bar, 3rd Floor, 19/4-5 Kotchasarn Road, Chiang Mai, Thailand. The Peak, 10th floor, Dusit Island Resort, 1129 Kraisorasit Road, Vieng District, Amphur Muang, Chiang Rai 57000. Steakhouse. 6.30pm-10.30pm.